I love being outdoors and the beauty of God's creation is very special to me. Most of my opportunities for nature photography have been in the Adirondacks but brief trips to other parts of the U.S. and Canada have been taken and more are planned. My first career was at Eastman Kodak but my interest in photography really blossomed in semi-retirement when I had more time to pursue it. I began with sunset pictures taken at our second home which is located at Lake Ozonia in the northwest corner of the Adirondacks Soon I was photographing the loons on the lake and the deer along the shoreline. Nesting osprey provided additional opportunities and as I invested in better photographic equipment, my capability extended to smaller creatures including ducks, mink and songbirds. Loons remain my favorite creature to photograph but wild mustangs, bald eagles, foxes, coyotes, and bears have made their way up my personal favorite ladder recently. Then there are warblers, bluebirds, cardinals, cedar waxwings, and the list goes on and on! Scenic or landscape photography has become more prominent in my thinking, especially as I've been able to spend time in the Canadian Rockies, Yellowstone, the Tetons, Yosemite and the Big Sur, Zion, Arches and Bryce Canyon, Glacier, and, more recently, Rocky Mountain National Park. Mountains have a special grandeur of their own besides providing a great habitat for some of the wildlife that I never saw growing up as a "flatlander" in Iowa! And while I saw a lot of the Pacific during my years in the Navy, it was a thrill to be able to spend several days photographing the beauty of the Big Sur. 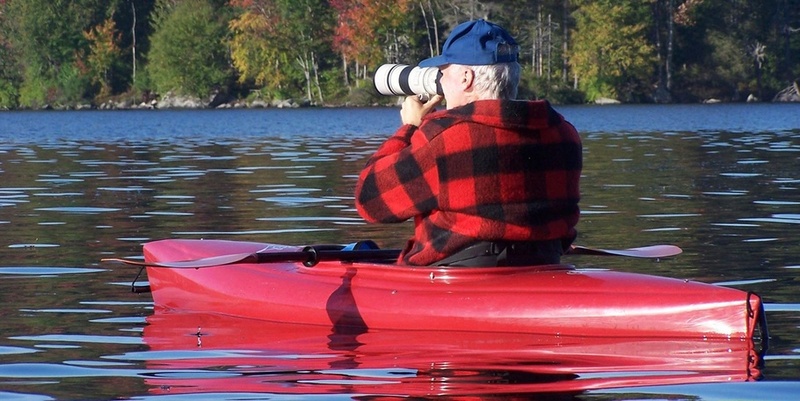 All of my common loon photographs and many other wildlife and scenic photos have been captured from my kayak and all are taken with a digital camera. I hope you enjoy viewing them as much as I enjoy experiencing and capturing nature's beauty.